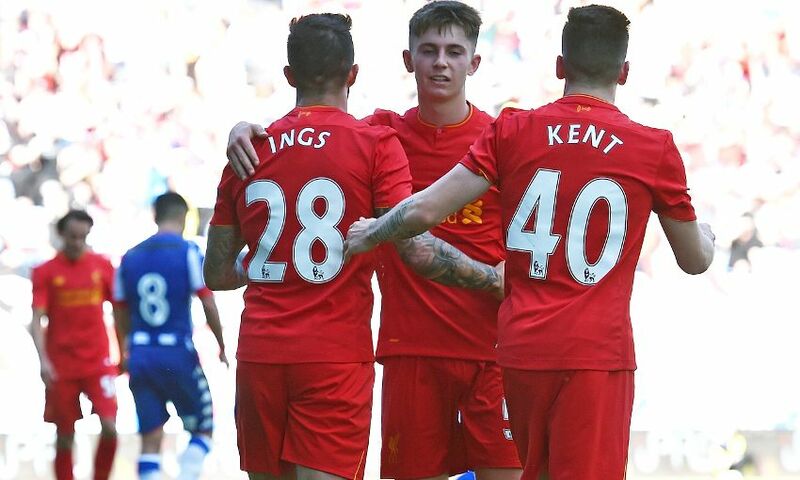 Second-half goals from Danny Ings and Ben Woodburn ensured Liverpool maintained their 100 per cent pre-season record with a 2-0 victory at Wigan Athletic. The pair, who had been among the eight players brought on after half-time, secured a third straight win for the Reds so far this summer with well-taken finishes at the DW Stadium. Philippe Coutinho made an eye-catching return to duty too, hitting the woodwork twice during his 45-minute runout in the first half, on another satisfying day overall for Jürgen Klopp. The Brazilian was inches away from opening the scoring in just the fifth minute. He stood over a free-kick 20 yards from goal, to the right of centre, and sent the ball twirling and dipping towards the top left corner – down it came but against the crossbar. Liverpool’s next opportunity of note fell to Coutinho too, created by sublime footwork from his compatriot Roberto Firmino on the right byline and a cross to the near post, but Wigan captain Jason Pearce blocked his flick towards goal. On 15 minutes, it was the turn of a post to thwart the No.10. Having controlled the ball and shimmied into shooting space in the box, a left-footer cannoned away off the inside of the goalframe. Joel Matip nodded a header over from Cameron Brannagan’s delivery and Coutinho curled another effort off target as the match settled into a pattern of the Reds having possession and the hosts looking to counter. But Klopp’s side – and Loris Karius in particular – breathed a huge sigh of relief on the half-hour. A square pass back to the goalkeeper from deep rolled underneath his foot and only a speedy recovery dive stopped Sanmi Odelusi tapping in the simplest of finishes yards out. At the other end, more Coutinho brilliance – this time in the form of a delightful pirouette in the area – teed up Sadio Mane for a close-range shot that was blocked by Wigan ‘keeper Lee Nicholls. And a low attempt on the follow up by the game’s stand-out player was saved too. The manager made eight changes for the second half, with only Karius, Matip and Connor Randall remaining from the XI that kicked off. Ings was among those introduced and within four minutes, the striker had a sight of goal. Played into space in the left channel, a slightly heavy touch took him to a narrow angle and his driven shot across the ground in search of the far corner was held well by Nicholls. An even better chance came Ings’ way shortly after but, having shrugged off several challenges to find room, the Englishman prodded the ball wide of the post. The No.28 tried to turn provider on 64 minutes, clipping an excellent pass inside a defender and through to the run of Lucas Leiva, who dragged his hit away from goal. With Liverpool’s fresh legs beginning to tell, Ryan Kent was the next Red to go close – sweeping a strike past the ‘keeper but wide after the play was quickly switched from the right flank to his spot on the left. The pressure soon told twice in quick succession, though. Lazar Markovic’s cross from the right was perfect for Ings to finally break the deadlock from close range in the 71st minute, and moments later a cool finish by Woodburn sealed another win for Klopp’s men.